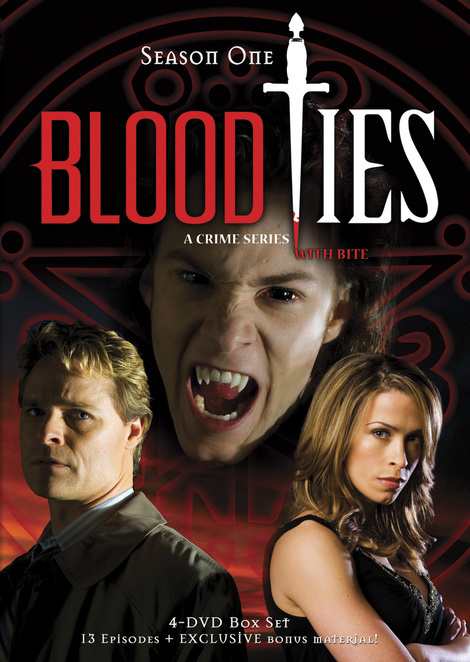 Blood Ties was a short lived series telling the story of Vicki Nelson, an ex-cop turned P.I who teams up with vampire Henry Fitzroy to solve crimes. The series was based on a set of novels by Tanya Huff. Despite a rather cheesy gimmick, the series largely works. This is mostly thanks to Christina Cox who is at the helm as Vicki Nelson, her physicality combined with a convincing emotional coldness makes for an interesting if damaged protagonist. Henry Fitzroy is also a fun character, for the history buffs out there he is the illegitimate son of Henry VIII turned to his vampish ways on a family trip to Transylvania. There is also Mike Celucci, Vicki's ex-partner on the force and sometimes lover or at least that's what's implied with all the heavy breathing and longing looks. The stories are silly and dramatic all in one. The series is highly flawed but very entertaining and has some really brilliant moments. The premise of a handsome young man who is a vampire falls for an older human woman is also more interesting and gives the audience more to think about. The visuals are fun as the creators have fun with the urban fantasy visuals of demons, vampires and ghosts in a modern city. A very enjoyable if short lived TV series.